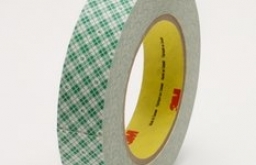 Description: 5.0 mil double coated paper tape with rubber adhesive 850 on a densified Kraft green plaid paper liner. Excellent balance of high initial adhesion and good holding power to a wide variety of materials. The paper carrier has been specially treated to improve its strength and removability characteristics from high internal strength surfaces. 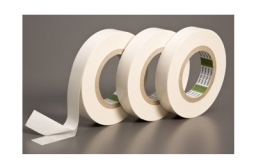 Standard Widths: ½", ¾”, 1" & 2"
Description: 3M™ Splicing Tapes utilize an acrylic pressure sensitive adhesive system that offers a balance of initial adhesion and good holding power. Used for high-speed flying splices and zero speed splices on most grades of paper such as newsprint, clay coated, and corrugated stock. 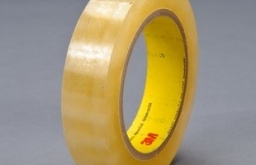 Standard Widths: ¼”, ½", ¾”, 1", 2" & 3"
Description: 3.9 mil double-coated tape featuring 3M Adhesive 300, a medium-firm acrylic adhesive system featuring both high initial adhesion and good high temperature holding power. Also features a polyester (PET) film carrier for dimensional stability and improved handling with ease of die cutting and laminating. Good shear holding power to a variety of surfaces. Standard Widths: ½", ¾", 1" & 2"
Description: Extended Liner with a 760 high tack synthetic rubber adhesive, providing excellent initial adhesion, polypropylene carrier, and 60 lb densified kraft paper liner. Medium temperature and solvent resistance. Used for heavy duty sealing. Mounting of promotional items. Core starting. Closure of overnight or express boxes, tubes or envelopes. POP Point of Purchase displays, FDA indirect food contact applications. 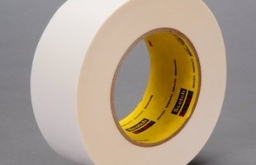 Description: 3M™ Repositionable Tapes are double coated tapes that are ideal for applications where one or both parts need to be repositioned or removed easily. Featuring a more permanent 400 acrylic adhesive and a repositionable 1070 adhesive on an Unplasticized Polyvinyl Chloride (UPVC) film. Slight differential tack. Low temperature and medium solvent resistance. 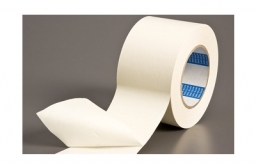 Standard Widths: ¼”, ½", ¾” & 1"
Description: 2.0 mil double-coated tissue tape which allows removal from many papers, foils, and films without adhesive residue and will not cause delamination of most paper stocks. 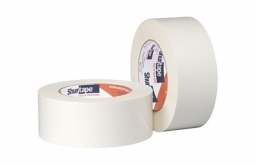 In many cases, the tape can be reused numerous times. Will not bleed into most paper stocks which helps minimize possible discoloration or staining. Standard Widths: ½" & ¾"
Description: 9 mil high-tack synthetic rubber adhesive which provides excellent quick stick or initial adhesion and bonds together a wide variety of materials such as metals, papers, paints and most plastics. 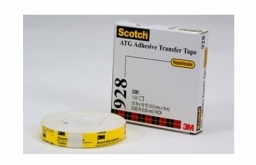 These tapes have a film carrier, which can add dimensional stability for aid in removal and also provides easier handling during slitting and die-cutting. 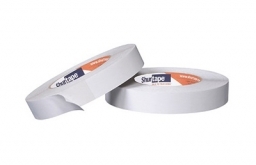 Standard Widths: ½”, 1" & 2"
Description: 5.4 mil, repulpable white paper tape with a high tack, high shear strength repulpable adhesive, on a repulpable kraft paper easy release liner. Excellent heat resistance up to 350 degrees F. Strong, conformable backing for core starting, tabbing, roll closing, zero speed splicing at the sheeter, splicing, tabbing, flying splice, automatic splice, mill splice, safety splice, and overlap splice. 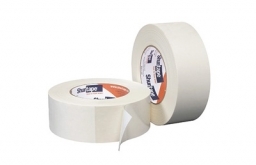 Standard Widths: 1" & 2"
Description: 6.0 mil beige crepe paper tape coated on both sides with an aggressive, pressure-sensitive natural rubber adhesive that bonds equally well on both sides to almost any surface. Features an easy release treated white crepe liner. Product is not repulpable. Uses included photograph mounting, carpet installation, steel-rule die (make ready), textile manufacturing (twister room), and in the printing industry. 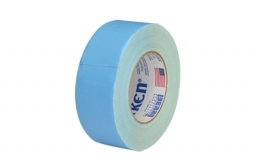 Standard Widths: ¾", 1" & 2"
Description: 7.4 mil highly versatile double coated tape that boasts super aggressive adhesion. Designed for a variety of splicing, mounting, holding and fastening applications. Ideal for splicing medium to heavy weight paper stocks. Solvent resistant for limited amounts of time. Standard Widths: ¼", ½", ¾", 1", 2" & 3"
Description: 13 mil heavy duty conformable double-coated cloth tape designed for honeycomb milling, industrial holding, mounting and carpet installation. Combines a heavy high-tack adhesive on both sides with an extremely durable cloth backing to provide excellent strength and superior conformability for various applications. Ideal for applications on rough & irregular surfaces, unfinished wood and concrete flooring. Is not affected by commonly used oils in milling applications and will remove cleanly. 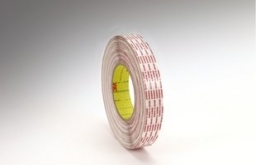 Standard Widths: ½", 1", 2" & 3"
Description: 13 mil high performance flame retardant double coated cloth backed tape. 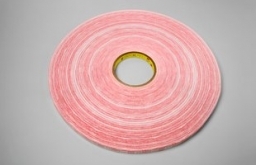 Engineered as a highly conformable carpet installation tape that maintains both Airbus and Boeing QPL approvals making it ideal in Aerospace markets as well as housing and construction applications. Quick stick properties and the bond improves with age. Also available in black. 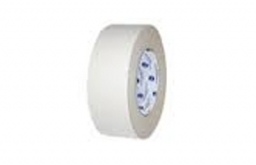 Standard Widths: ½", 1", 2", 3" & 4"
Description: 11.0 mil double sided cloth tape with release liner. Extremely aggressive adhesive. Designed for residue-free removal. General purpose uses in construction and multipurpose use for general mounting and holding. Standard carpet hold-down in the entertainment and event planning industries. 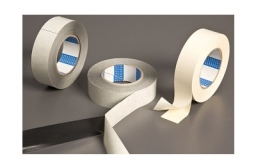 Description: 12.0 mil industrial grade double faced polyester/cloth tape is used for mounting, holding, splicing, tabbing and fastening of a variety of substrates when an aggressive adhesive is needed. Good tensile strength. Superior, aggressive adhesion to a variety of substrates. 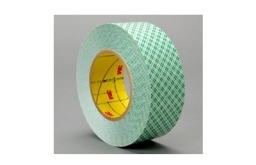 Description: 5.0 mil general purpose double faced paper tape is used for mounting, holding, splicing, tabbing and fastening of a variety of substrates when an aggressive adhesive is needed. Good tensile strength. Superior, aggressive adhesion to a variety of substrates. 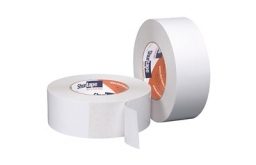 Standard Widths: ½”, ¾", 1", 2" & 3"
Description: 4.4 mil double-sided film tape ideally suited for mounting banners, light signs, window blinds, emblems, and nameplates. It can also be used where permanent bonding or attachment is required, including POP displays and laminating materials. Converter friendly. 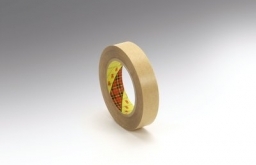 Description: 4.5 mil double-sided tissue tape offers high adhesion and quick stick, with superior temperature resistance. Designed for demanding corrugator splicing applications. Ideal for manual applications and perfect for mounting and laminating irregular shaped metals, foams, foils, and nameplates.